Bing was a German toy company founded in 1863 in Nüremberg, Germany by two brothers, Ignaz and Adolf Bing. Originally, Gerbrüder Bing produced metal kitchen utensils. They began toy production in 1880 and incorporated in 1895. By 1905, Bing was the largest toy company in the world, and Bing's factory in Nüremberg was the largest toy factory in the world, employing 3,000 people. By 1914 Bing had 5,000 employees, and at the height of its success, the company employed over 16,000 workers. 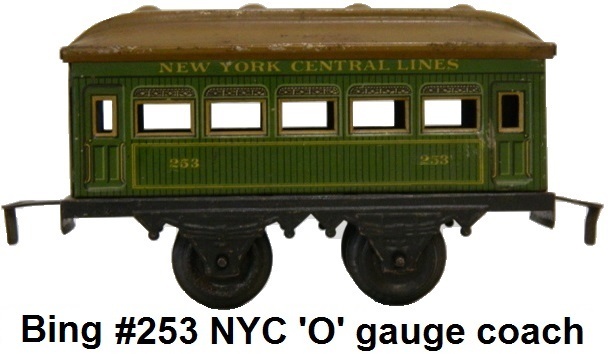 Although Bing produced numerous toys, it is best remembered today for toy trains. In addition to toys and kitchen wares, Bing also made a huge range of office equipment, and electrical goods. These manufactured products included toy boats, ships, cars, trams, magic lantern equipment and the slides for the lanterns, optical equipment, electric and steam motors and components, hot air engines, and induction coils. Also made were experimental electrical equipment such as Gessler and Rontgen tubes, dynamos, powered fountains, science kits, and early telephone equipment. Bing products were sold throughout Europe and North America. Bing's first trains hit the market in the 1880's. 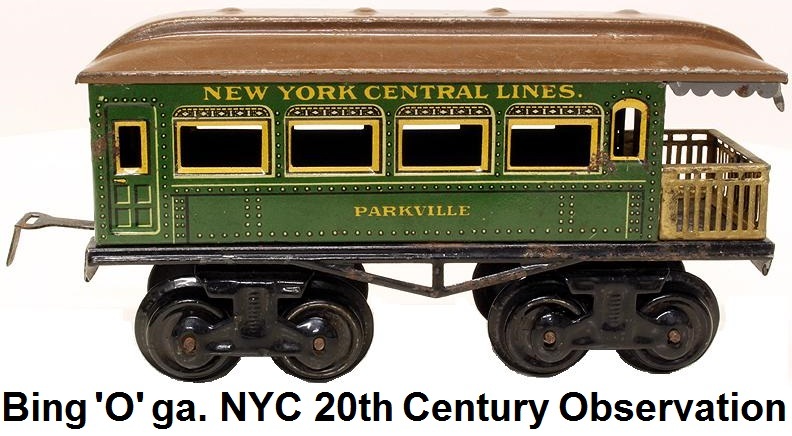 Bing was one of the first companies in the world to produce toy trains that ran on track. 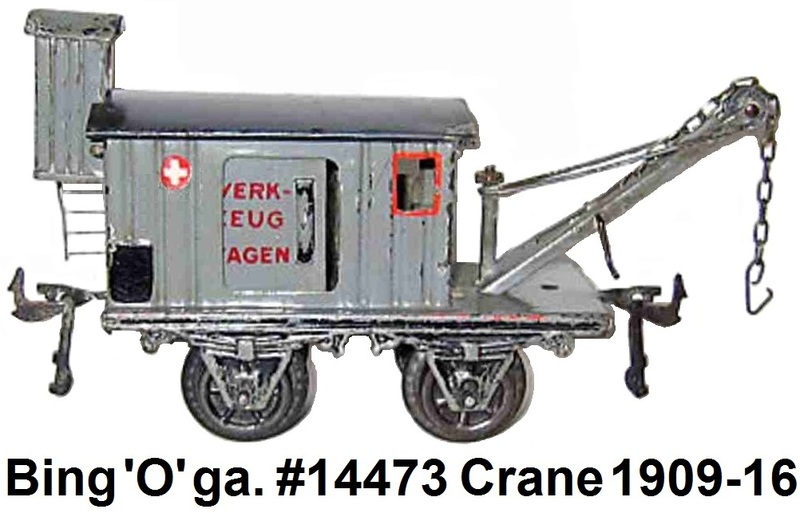 When Märklin formalized several standards for track gauges in 1891, Bing adopted them, and added 'O' gauge by 1895 and gauge III (2.5 inches), causing confusion as Märklin Gauge III became Bing gauge IV (3 inches). In the early 1920's, under the auspices of Bassett-Lowke, Bing introduced a still-smaller gauge, half that of 'O' at 0.625 inches, which it called 'OO'. 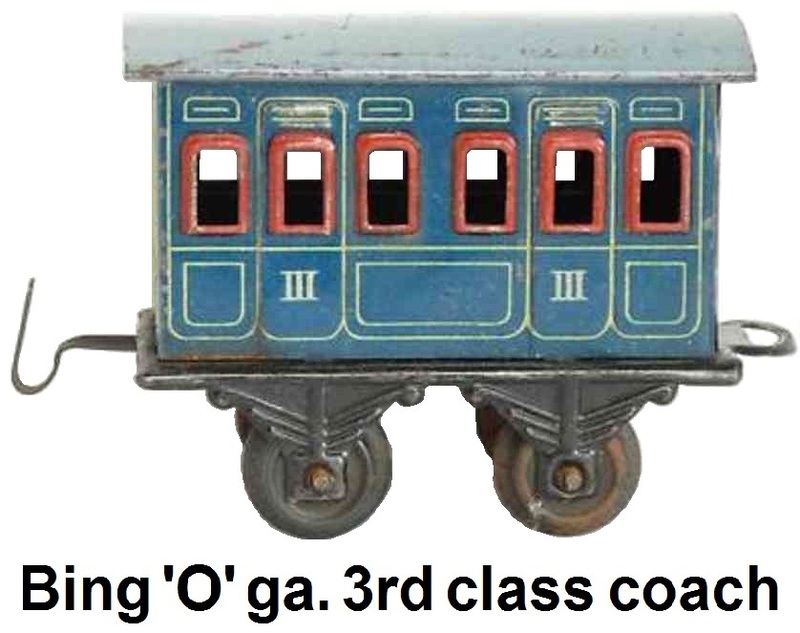 However, Bing's 'OO' gauge at 4mm scale became a British standard, larger than the 3.5mm scale on the same gauge of track favoured elsewhere. 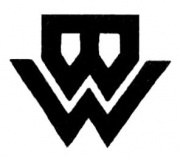 The company was initially named Gebrüder Bing (Gebrüder translates to brothers in German) but Ignatz Bing died in 1918 at the age of 79, and the company was renamed Bing Werke (Werke being German for Works). 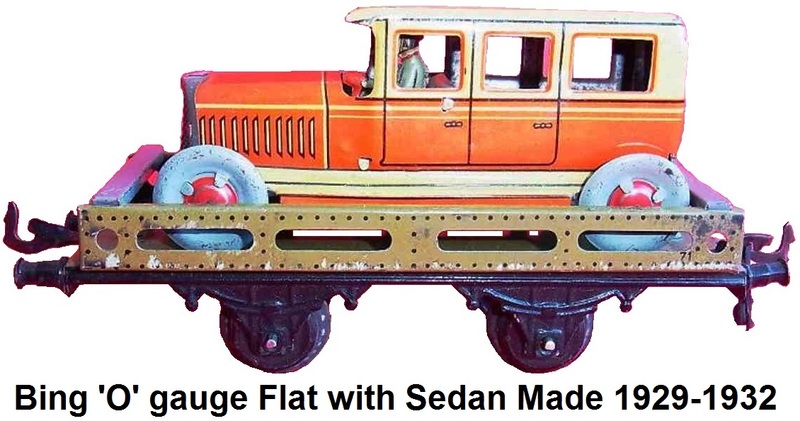 Bing's line of stationary model steam engines was one of the most diverse. 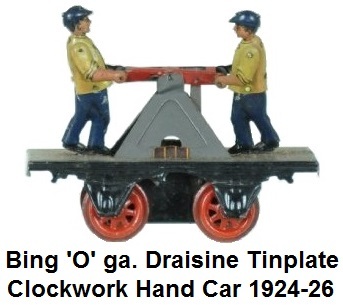 Bing also made tinplate lithographed toys in general, and a large amount of model railroad equipment, which included live steam driven locomotives, clockwork driven locomotives, electric powered locomotives, entire track systems with turnouts and crossings, elaborately detailed stations, signals, bridges, railroad buildings and accessories. Early assembly employed hand shaping and soldering methods along with hand painting. 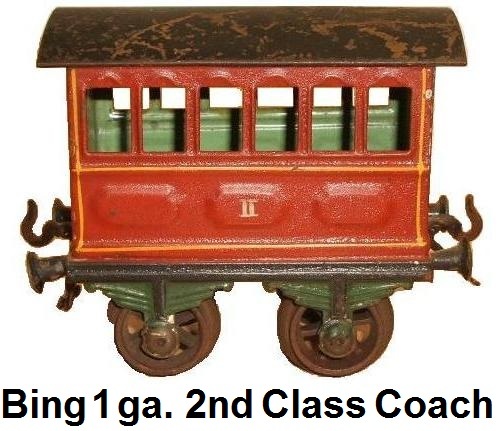 Many of these early trains suffered from paint crazing due to varnish shrinkage. Later Bing perfected the "Nüremberg Style" of manufacturing toys on steel sheets with lithographed designs that were stamped out of the metal, formed, and assembled using tabs and slots. This manufacturing method remained in widespread use well into the 1950's, long after Bing had ceased to be in business. In the early 20th century Bing produced numerous items for export which were then sold either under its own name or for other companies. 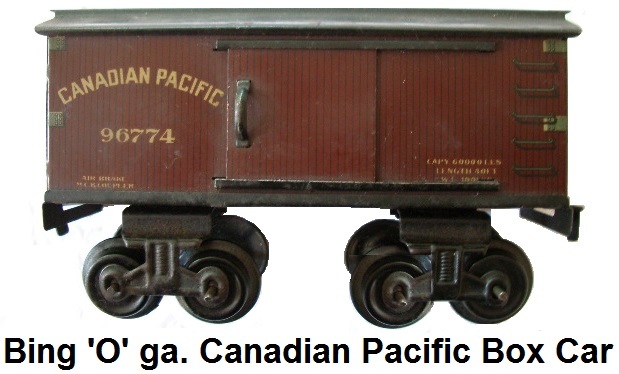 Bing eventually produced trains for the British market for Bassett-Lowke and A. W. Gamage, and it produced trains for the North American market, which it exported and marketed on its own. 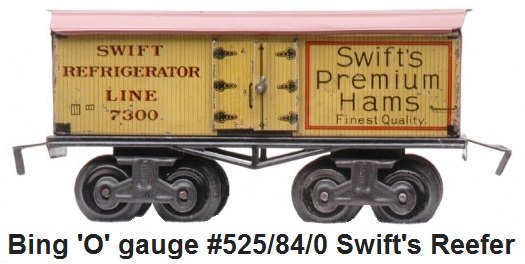 The model railway products exported and sold in the United Kingdom were very popular but initially did not reflect the actual prototypical styles and types of trains that ran there. Instead the trains appeared to be more like German prototypes. Bassett-Lowke would repaint the Bing trains it re-sold, so they bore British liveries, but these were still not English looking styled trains. To correct this issue, W.J. Bassett-Lowke provided Stephan Bing with designs for more English looking locomotives that were produced in Germany for re-sale in the UK. Both companies retained a tight working relationship until it was disrupted by the outbreak of World War I. The gauge 3 LNWR Black Prince live steam powered locomotive was the first engine designed after an English prototype by Bing in 1902 from plans provided by Bassett-Lowke. The Midland Railway version of the Black Prince #2631 was a staple in the early Bassett-Lowke range of products up until the outbreak of World War I. 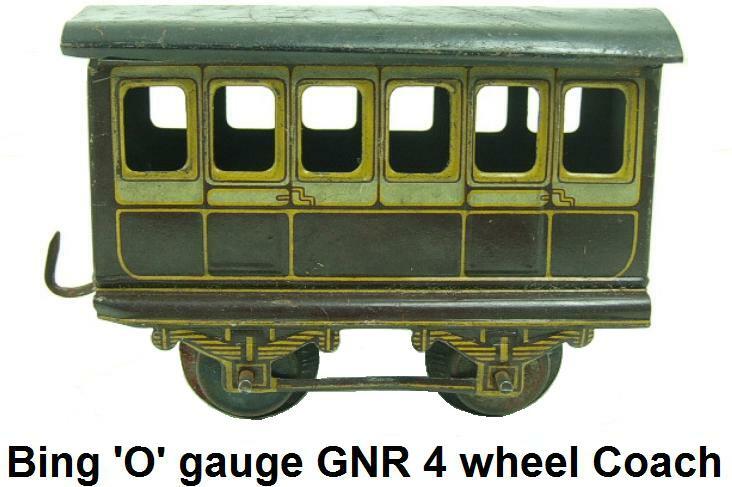 It was improved over time and later versions in gauge 2, gauge 1 and 'O' gauge were also made by Bing. 1902 also saw the release of a steam driven four-coupled Pilot Tank locomotive in 2 gauge. It did not appear in a Bassett-Lowke catalog until 1904. In 1904 Bing produced a 2 gauge Midland Railway 4-2-2 locomotive and tender powered by live steam. 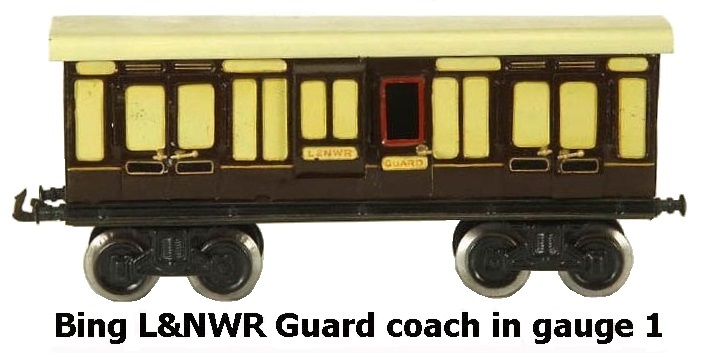 It was accompanied by a Midland guard/luggage van and a passenger carriage. Also in 1904, through a special commission funded by the Great Central Railway of Britain, Bing produced a 1 gauge clockwork powered 4-4-0 Sir Alexander locomotive #1014 with a cream and brown coach for Bassett-Lowke to offer as a competition prize for its customers. This type of subsidy enabled Bassett-Lowke to promote a whole new product line and strengthen its partnership with Bing substantially. 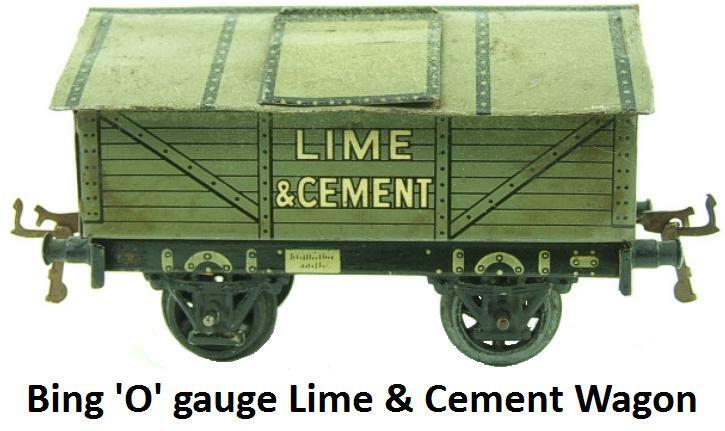 The model train was available both through Bassett-Lowke and from the Great Central Railway. A black clockwork gauge 1 model of an LNWR 4-4-0 Precursor locomotive #513, with red and gold lining was made by Bing for Bassett-Lowke in 1907. 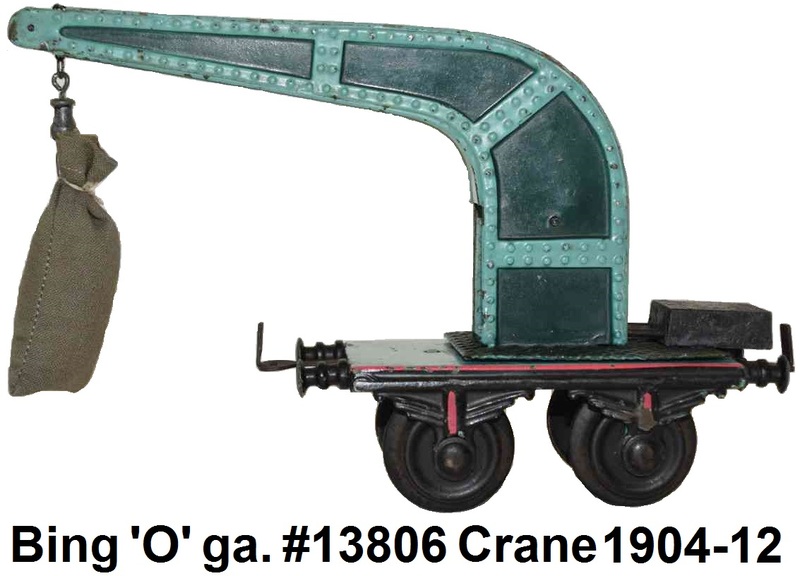 In 1908 Bing manufactured a green gauge 1 steam powered model of the old GWR County 3800 class 4-4-0 County of Northampton loco #3410 for Bassett-Lowke. 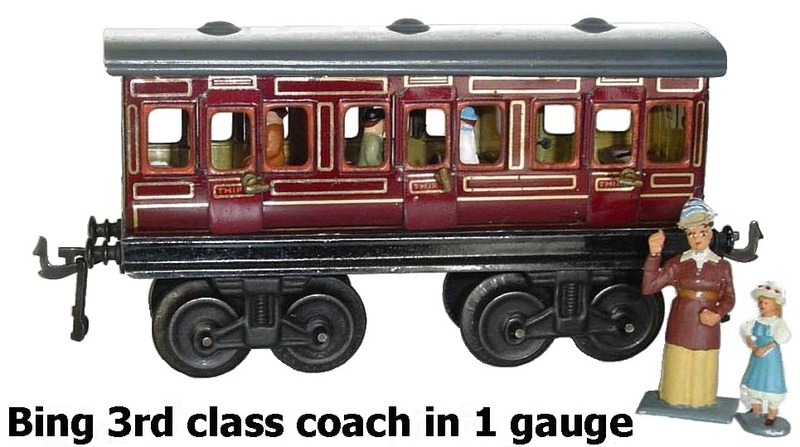 A green 0-4-4 clockwork gauge 1 model of the London and South Western Railway M7-Class tank locomotive #109 was made by Bing for Bassett Lowke in 1909. 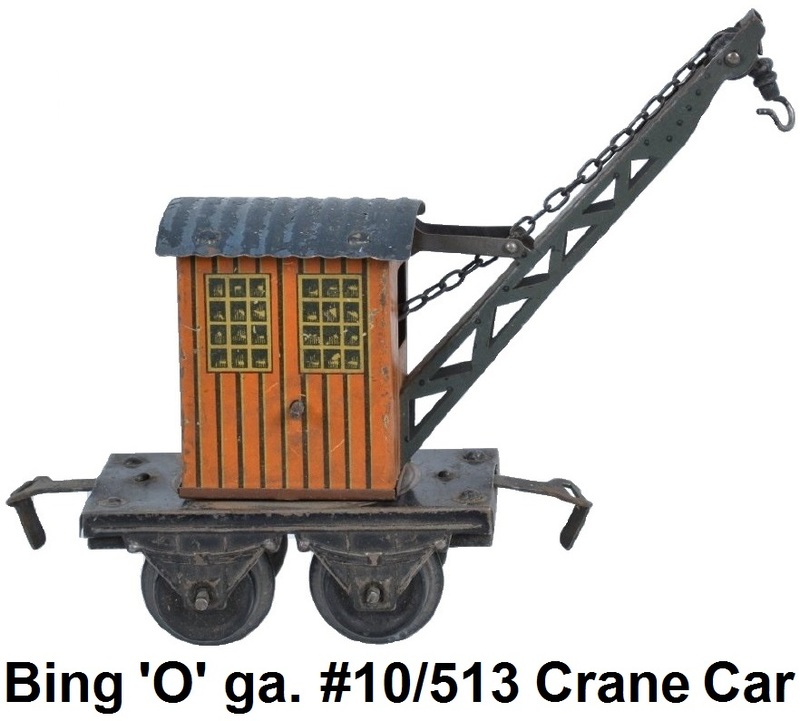 In 1910 Bing introduced a line of engines, passenger cars and freight cars for the North American market through the John Bing Division that operated from offices on Fourth Street in New York City. This was an effort to jockey for market share with the Ives Manufacturing Company. 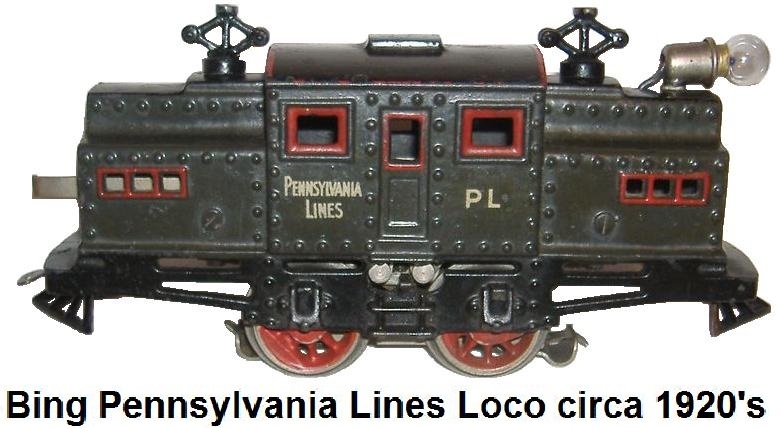 At the time, the Ives line offered one 2-4-2 electric outline electric locomotive, which Bing copied. 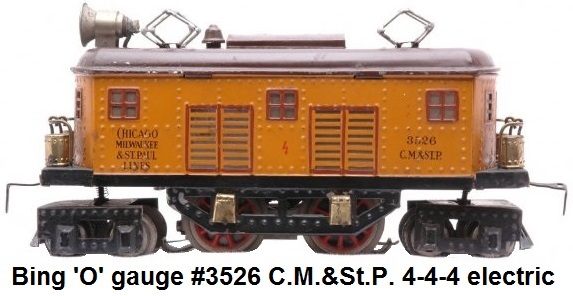 They copied the Ives model to the extent that the actual Ives catalogue #3238 appeared on every electric outline locomotive, large or small, electric, or clockwork, made by Bing. 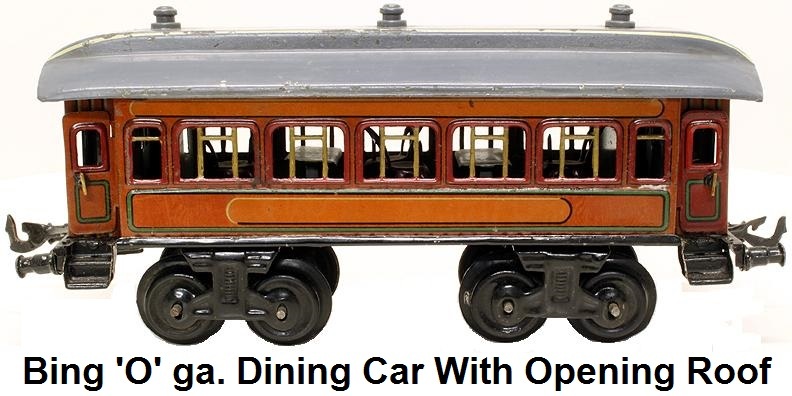 Bing also issued a series of six inch tinplate passenger cars that were very similar to Ives passenger cars, except that Bing also issued a combine and an observation. 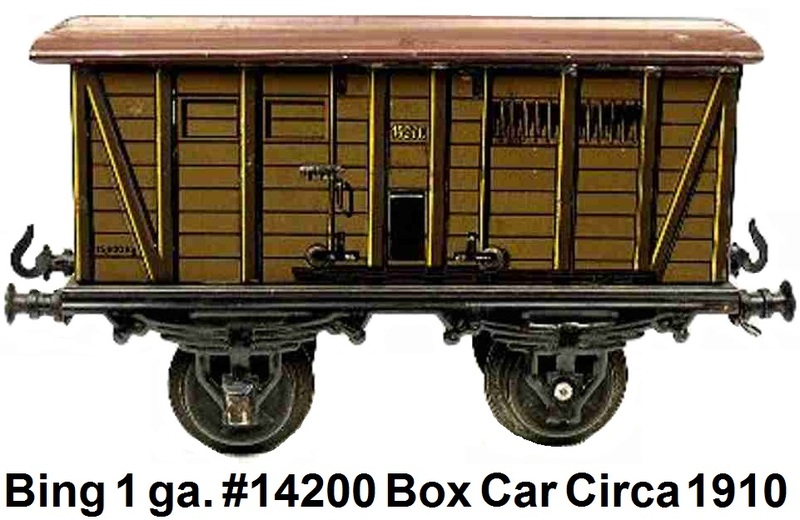 Bing's line of four-wheel road name boxcars, modeled after photographs of American freight cars, were similar to the Ives #53, except the Bing boxcars included doors that opened and closed. Throughout their histories, the two companies would frequently copy one another's designs. In some instances, the two companies even used the same catalog number on their competing products. Due to cheap German labor and low shipping and duty costs, Bing was often able to undercut the prices of its U.S. competitors. But, Ives did eventually surpass Bing in sales. Bing didn't seem to care that designs of other manufacturers were the intellectual property of those companies and on many occasions was forced to make changes to their products in order to comply with legal actions taken against them in court. Bing created a chunky green 0-4-4 clockwork 'O' gauge model of London and South Western Railway M7-Class tank locomotive #109, for Bassett Lowke in 1911. In 1913 Bing issued a black 'O' gauge 0-6-0 clockwork model of LNWR locomotive #1269, with red lining, for Bassett-Lowke. These locomotives were popularly referred to as the "Cauliflower Class". By 1914, Bing had 5,000 employees and the business was doing quite well. By comparison, Märklin employed 600. Bing made a green electric gauge 2 model of the Great Central Railway Class 9N 4-6-2 Tank locomotive #165 for Bassett-Lowke in 1914 just before the outbreak of the hostilities of war. Also in 1914, a brown clockwork 'O' gauge Midland Railway 4-4-0 990-Class locomotive, #999, was made for Bassett-Lowke. With the outbreak of the war in 1914 production shifted to helmets, canteens, military cookware and knapsacks, but in the last years of the war production of peace-time products and goods was resumed. took the reigns of the company. By 1921, Bing had re-established itself in the U.S. market, largely via sales through catalog retailer Sears, Roebuck & Co. 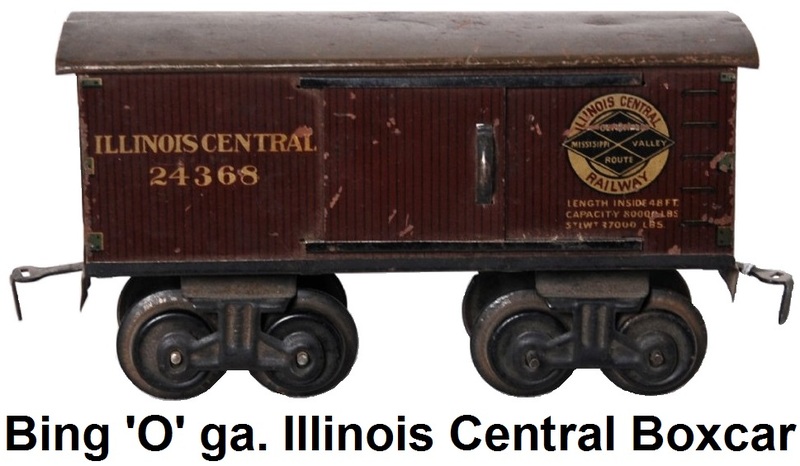 However, by 1925, Lionel was also selling through Sears, and Bing quickly found itself squeezed out of the market. Bing attempted to compensate by increasing its presence in Canada, where it competed with mixed success with American Flyer. All of this competition did not stop Bing from its continued success and revenues rose to almost 27 million Deutschmarks per year. A plan to help boost revenue was the development and introduction of the new Bing table top railway in the 1920’s that was 'OO' gauge. 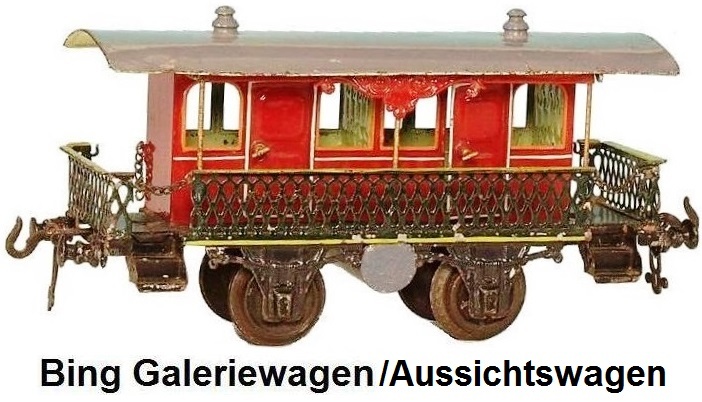 Initial models were made of tinplate and were clockwork driven, and latter came a few electric engines, but the system was very toy like and clunky, and the new size scale was not particularly popular. 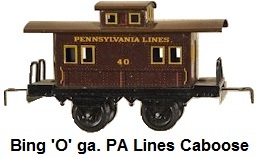 Bing made 'O' gauge electric trains that could run on 110-125 volts and trains that could run on 220-250 volts house current using transformers or rectifiers. The 110-125 trains operated at 12 volts. The 220-225 trains operated at 18 volts. The electric powered trains employed 3 rail track. 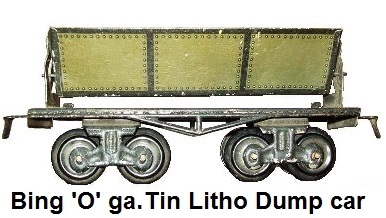 Trains were made of tin and metal, and were typically hand painted and lined. Many of the passenger trains included detailed interiors (chairs & tables) as well as interior lighting. Electric locomotives were fitted with a reversing mechanism (forward & reverse). Bing continued to supply Basset-Lowke with well- made models and in 1922 a brown electric gauge 1 London, Brighton and South Coast Railway 4-4-2 I2-class tank locomotive, numbered 11, was created. 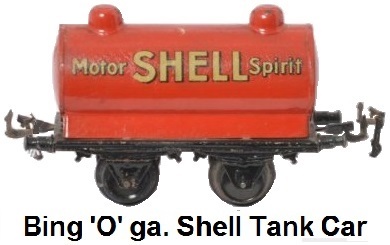 An 'O' gauge version of this same Tank Loco was issued in 1915, and it to bore the LBSCR livery and #11. Also in 1922 a black electric gauge 1 model LNWR 4-4-2 "Precursor Tank" locomotive, with red lining, a crest and "L&NWR" on the tank sides, and numbered 44, was made by Bing for Bassett-Lowke. 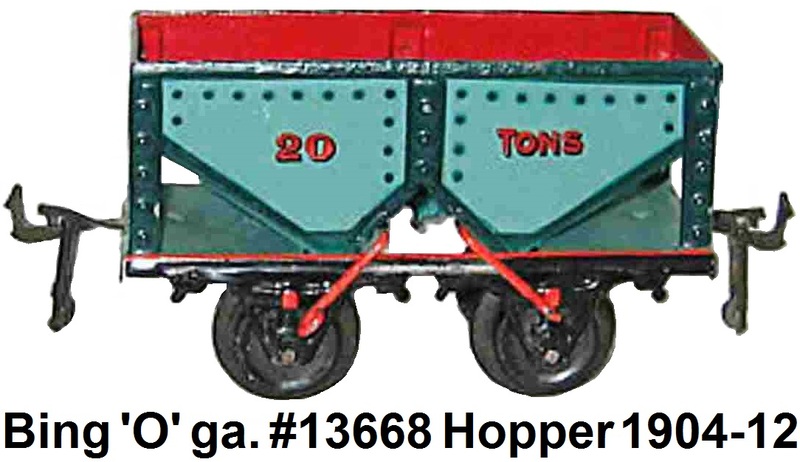 In 1923 Bing produced a 1 gauge two-tone green electric model of the Great Northern Railway's 0-6-2 N1 tank loco #190 with green wheels and red and black underworks for Bassett-Lowke. 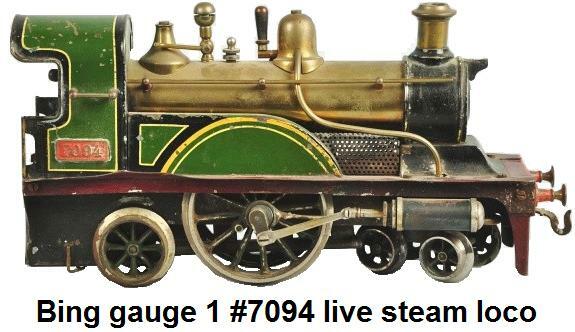 Live steam models were still being built as well. A brown gauge 1 steam-powered model of the Midland Railway's 4-4-2 tank locomotive #2178, with a white sign-strip above the front buffers reading Tilbury was made by Bing for Bassett-Lowke circa 1926. 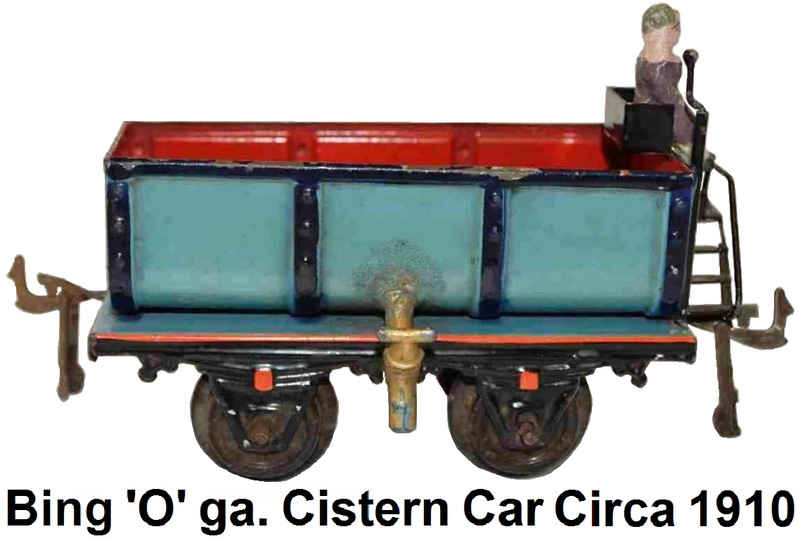 Bing also manufactured a gauge 1 0-4-0 Standard Tank Locomotive numbered #112 in either electric, live steam or clockwork for Bassett-Lowke during the 1920's. 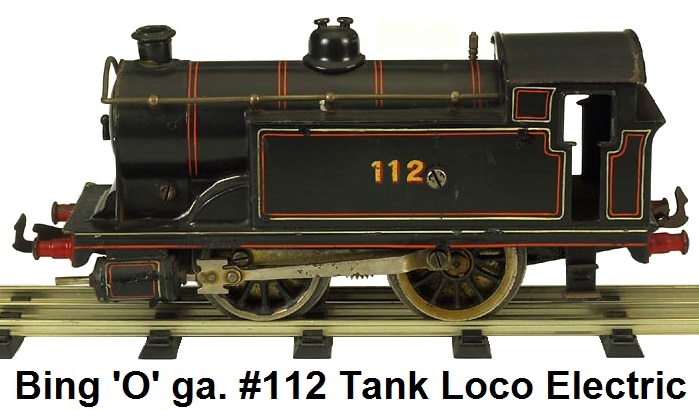 The loco was numbered #112 as a reference to the address of the Bassett-Lowke shop located at 112 High Holborn, London. The "112" was available in six different railway company liveries, giving buyers a choice of black, red, green or thanks to the Caledonian Railway - blue. 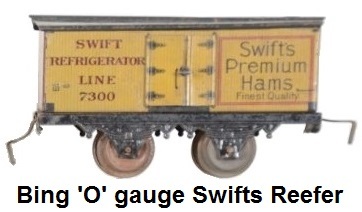 Later, an 'O' gauge version was also made. This combination of six different railway liveries, three drive types and two gauges meant that this locomotive was available in 36 different versions. George the Fifth was originally an LNWR prototype 4-4-0 locomotive, numbered 2663 and painted black. After the LNWR was taken over by LMS in 1923, the locomotive became a maroon engine with running number 5320. 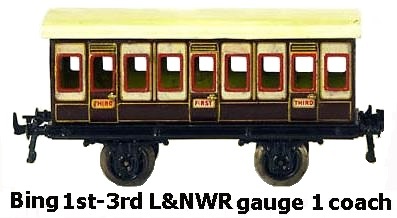 Bing modeled both of these versions for Basset-Lowke in 'O' gauge clockwork, the LNWR version around 1912, and the LMS version around 1923. Fortunes turned and by 1927 Bing was in serious financial trouble and the company's president, Stephan Bing, and his son, left the company. The US stock market crash of 1928 resulted in huge debts on the part of the John Bing division in New York being called in, for which the parent corporation had to take responsibility. This led to financial difficulties for Bing Werke, but given the political climate in Germany in 1932 (the Bing family was Jewish), no bank would loan Bing additional money. Bing Werke ceased to exist in August, 1932, and the assets were liquidated. Much of its tooling was acquired by rival toy companies. 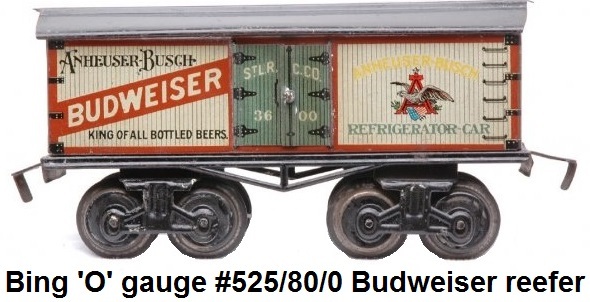 Falk and Krauss purchased the model steam related equipment, while Karl Bub of Bub Trains took the model train line, Fritz Hintermayr acquired the name and the gas boiler production, and Fleischmann bought up the model boat fabrication tooling and machinery. Bub continued building the Bing line of trains until the onset of WW2, and later folded completely in the 1960's. Bing went out of business for good in 1933 and the factory was abandoned. When Stefan Bing left the family business in 1927, he ventured out on his own. He purchased the Nüremburg firm of Fortner & Haffner, another maker of tinplate toys. Bing joined with Siegfried Kahn, who was credited with being the inventor of the Twin Train running system, to build on their experience and develop a more comprehensive 'OO' system. 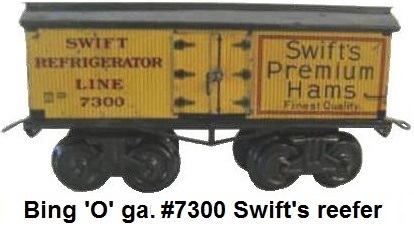 In 1935, this firm produced its first model trains, under the Trix Express label. This new line of trains were unveiled for the first time at the 1935 Leipzig Trade Fair. Bassett-Lowke assumed distribution in the UK together with Trix Ltd., an English company established in 1932 in Northampton by Bing to make construction sets mainly for Woolworths. In 1936 production started in England of Trix-Twin trains being the English outline of the German models. 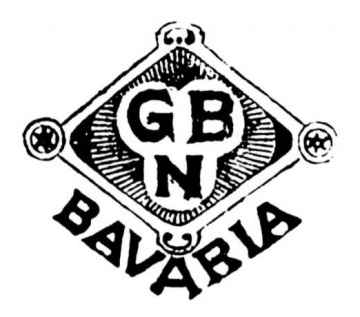 Two years later, when the National Socialists replaced the executives of the German company (they were also Jewish), Stefan Bing continued production with Bassett-Lowke, under the Trix name. Trix survived, and in fact thrived for a number of years in both Germany and England under different ownership. 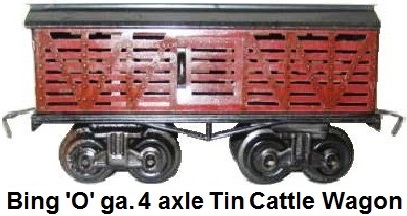 The German company of Trix was purchased by Märklin in 1997. The English company changed ownership several times after 1957 and ended up in 1973 absorbed into Liliput, an Austrian toy and model railway company. 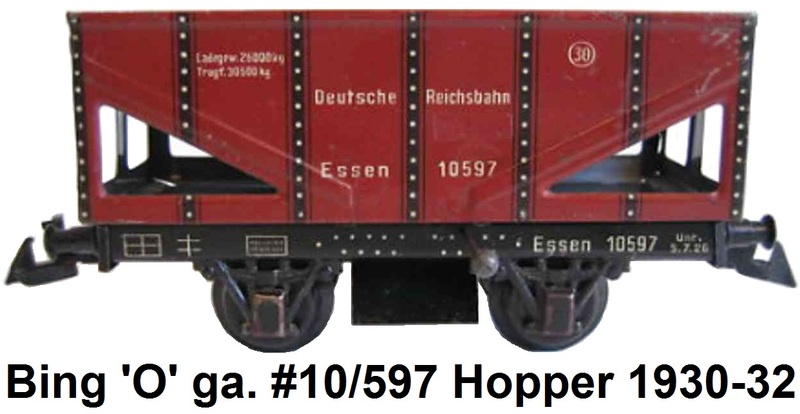 Stefan (also known as Stephan) Bing did emigrate with his family to the UK in the late 1930's to escape Jewish persecution from the government regime of Adolf Hitler, and he maintained business with W. J. Bassett-Lowke to make and sell Trix 'OO' gauge trains. Bing passed away in April 1940. His son Franz and daughter Lilli Sommer continued operation of the train business until 1957. Bing items can be identified and dated by its trademark. 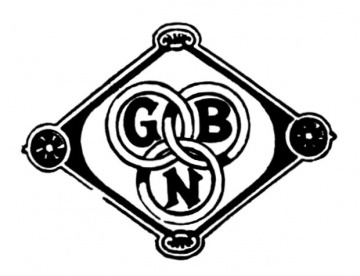 Items bearing the letters "GBN" (for "Gebrüder Bing Nürnberg" — "Brothers Bing Nürnberg") in a diamond date before 1923, while items bearing a sideways "B" next to a "W" (for "Bing Works") date from 1924 to 1932. 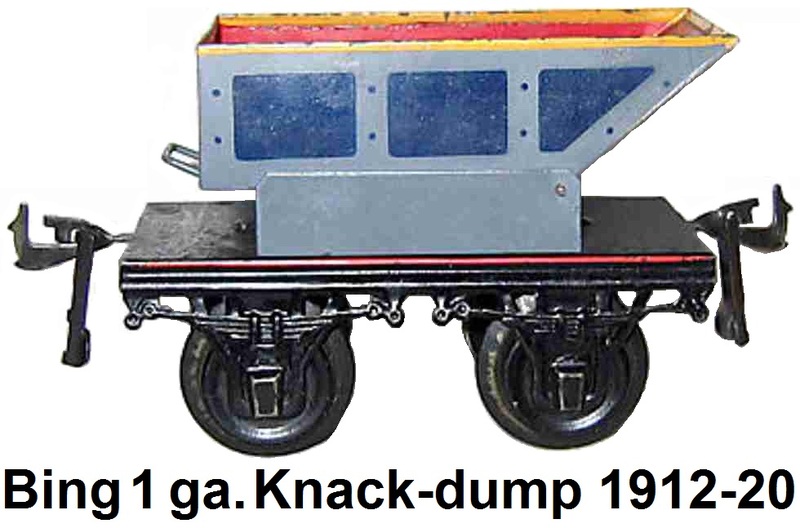 A trademark showing an upright 'K' and 'B', a dash, and a sideways 'B' over an upright 'W' indicates trains made after 1933, that are a combination of Bub & Bing manufacture. Bing trains are prized by collectors today. When the Denby Collection of miniature toys was presented at Tennants specialist auction in the United Kingdom in June 2009, a live steam locomotive sold for £8,000. Bing catalogs are extremely rare. If one is sold it almost always comes from the late 1920's or early 30's. The catalogs were printed in black & white with the exception of the second trader catalog addendum from 1929. In that catalog there were some innovations with color illustrations.